We would appreciate feedback if you can suggest better ideas for the website. Situated on the South Gippsland Highway, Meeniyan is a picturesque country township and is the turning point to Wilson’s Promontory and Latrobe Valley. The median strip lined and shaded by mature trees is the home of the war memorial, drinking fountain and picnic tables with connecting footpaths and flower beds. 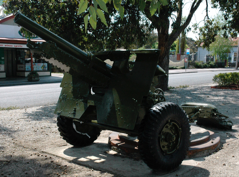 The gun was decommissioned in New Guinea and sent to Qld. It was then sent to Korumburra where the C.M.F. transported it to Meeniyan in the mid 1970’s. The flowering gums were planted in 1919 by school children, one of them being Frank Hanily. The memorial was erected by the R.S.L.. The council maintains the gardens. The trees in the centre median strip consist mainly of gums, dutch elms and ash trees. The Great Southern Railway opened up the country, joining Dandenong to Port Albert. The railway bridge across the Tarwin River cost $10,000 to build. The line was officially opened on the 13 January 1892. A new rail trail bridge has been constructed in front of the old railway bridge. Opened in July 1939, it was built to replace the original hall (1892), which burnt down the in 1938. It immediately became the entertainment centre for the district balls, dinners, movies, cabarets, debs you name it - 7 nights a week. The most enduring event was the Saturday Night Dance 1939 to 1976. Attracting up to 800 weekly from far and near. The region of South Gippsland is reputed for producing artists of real talent; however many have not achieved local recognition, due largely to a scarcity of quality gallery space and lack of professional management. The Meeniyan Art Gallery opened in March 2002 with the intention of providing an exhibition venue for our talented artists, and with it, the potential for recognition. “Get some ‘Meeniyan’ in your life” recommends Tim Gorman. Could be a good logo here? 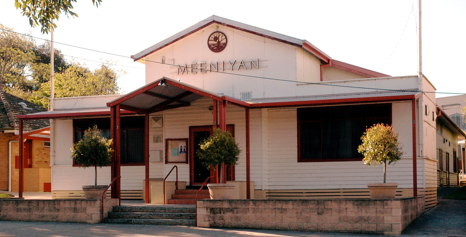 Meeniyan Community Website is run for Meeniyan Progress Association by Richard Powell for the Meeniyan Community. This website is hosted by DCSI. If you want to put a community notice, ad or story on the website, email me. The only town in South Gippsland with free wifi!